We provide very Custom Concession Beach Carts for hotels, resorts, amusement parks… who offer food and or beverages on the beach, poolside, pier, boardwalk, athletic field, golf courses and more. This is a great investment because your business is mobile and you can choose the best location on any given day! 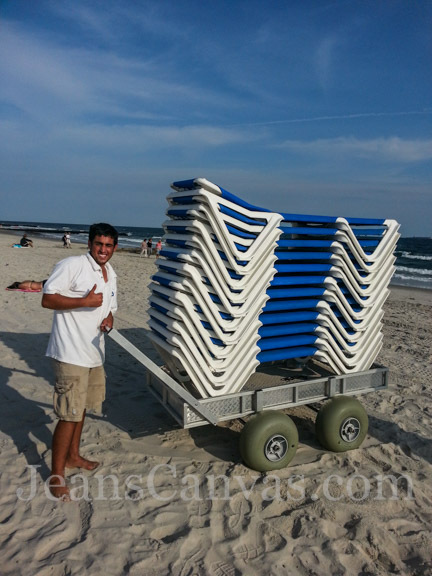 Jean’s Canvas Products have experts who design the Custom Concession Beach Cart of your desire. Ice cold adult beverages and soda or prepackaged foods. It can be a simple Beach Cart with ice and drinks to a multicompartment insulated flip top Cart with umbrellas, your custom logos and designs on the sides. Jean’s Canvas Products can do it all for you! Your Cart will be 100% functionable and look great! Contact us today so we can create a Custom Cart for your portable mobile business. We ship everywhere!